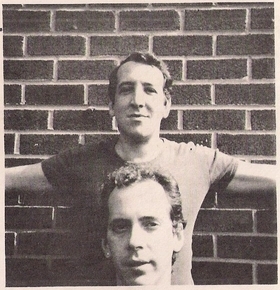 Between 1981-84 the Electronic / Synth-Duo Stefan Tischer and Keith „Keeler“ Walsh have produced 4 great and outstanding Synth-Tapes on their own Tape-Label. (Through Veils in 1981, Eve of Departure in 1982, Crossings in 1983 and Travellers Companion in 1984). This Double Lp features one 30 minute-extract of each of those Tapes ending in a beautiful 2-hour-journey of Port Said Music. In an almost alchemistic way Port Said formed an very unique characteristic Sound which was inspired by electronic Krautrock-bands and artists like Cluster and Conrad Schnitzler and their fascination for oriental elements. Port Said also contributed to various international compilations of the Cassette-culture on Labels like Ding Dong (Film Noir), Antonios Stratis Label Temporary Music (Life 85) ,Audiofile Tapes (Hear the Roar od Mountains Vol.1) or the french L'Agence Des Refusés (The History of Jazz). Unfortunately both artists died in 1992 and 2010 but fortunately, their great musical output will never be forgotten. After the excesses of the 1970’s, the early 1980's were once again a time for a musical Revolution. Electronic Equipment and Instruments became more accesible and affordable and the D.I.Y "do it yourself" Movement was just starting. College and University as well as Public Radio Stations started playing "alternative" music and Pre-Internet Fanzines and Publications like Alien Soundtracks and CLEM eagerly spread the word around the world. Musicians from all over the Globe recognized, that working together and putting out the music they liked, was better than competing with one another for that "elusive" major or Indie Record contract. Stefan and Keith of Port Said were one of the thousands taking advantage of the new avenues presenting themselves. While a select few did achieve some form of fame and very little Fortune, most artists and Port Said among them, never achieved the recognition they so justly deserved. Both Keeler and Stefan worked tirelessly up to their untimely passing on creating the music THEY believed in, without compromise, as their huge back catalog of solo works and collaborations attest. It is therefore a fitting Tribute to release this compilation of some of their BEST work, perhaps some new ears will discover how avant garde these guys really were. May their Music live on in the Universal Spheres for Eternity.